Oooh! Your jam looks glorious! I love chunky, super fruity preserves like this. You just can’t go wrong simmering ANYTHING with vanilla bean! Your friend is so lucky to have a peach tree! I’m sure she’ll enjoy this recipe. Peachy keen is absolutely what this is! And i like the chunks! Makes it more fun to eat when you have that extra texture! Chunky is good. I think I prefer compote over jam anyway! Looks delicious. Sounds delicious! I think I like the extra chunks of peaches as well 🙂 This with pancakes would be amazing! We should totally do a jam exchange… It might be a little impractical via U.S. mail, but we went a little nuts this year and I think jam (or compotes/preserves) are meant to be traded. Derek and I did our first canning projects this summer and I am hooked. Yeah! That would be so cool! I bet you two canned up some amazing stuff. I’m kinda hooked too. YUM! 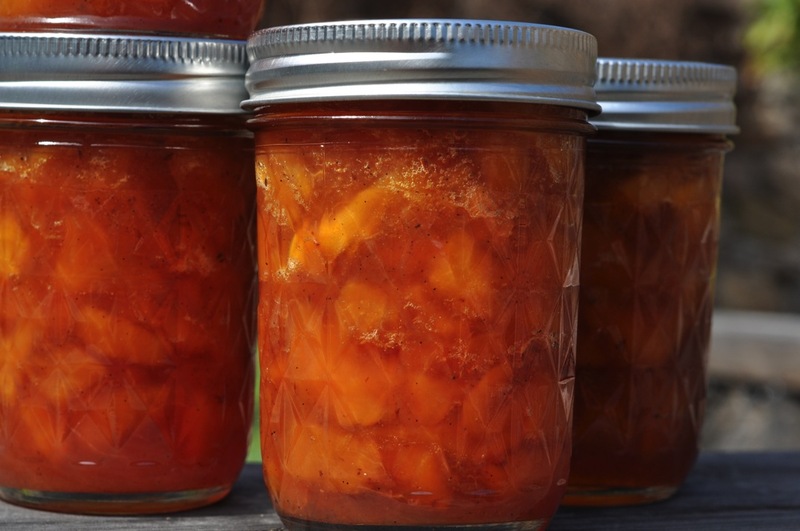 I’ve made peach jam before, but I thought it needed a more mild sweetness. The vanilla bean is a great idea!